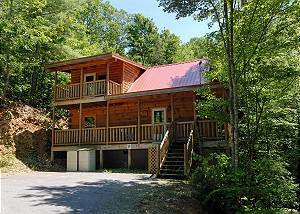 Pine Cove Hideaway is a great two bedroom, two bath log cabin located between Pigeon Forge and Gatlinburg. This beautiful cabin offers two master... VIEW NOW. For the ultimate in relaxation, enjoy a refreshing soak in the hot tub on your cabin’s private deck! The bubbling waters and soothing jets will help relieve your tension and sore muscles, making you feel better than you have in months. The hot tub feels particularly wonderful after a day of walking the streets of downtown Gatlinburg or hiking at Great Smoky Mountains National Park! For a special treat, soak in the hot tub during the evening hours where you can witness the twinkling night sky above the Smokies! Whether it is the crackle of the fire, the soft orange glow or the sight of the dancing flames, there is just something special about the ambiance of a fireplace. You will be delighted to know that our cabins in Gatlinburg TN each feature a fireplace where you can enjoy all of these awesome features! Kick back by the fireplace while you share some laughs with your family members or stay up late to read the latest bestseller. The warmth and ambiance of the fire are sure to make you feel completely relaxed! Once you arrive at your cabin from Acorn Cabin Rentals, you will be amazed by the breathtaking scenery of the Smokies! Take time to relax on your cabin’s deck to admire the beauty of the mountains and the splendor of nature at its finest. Whether you visit during the winter to see the snow-capped mountain peaks or during the summer to witness the gorgeous wildflowers, you will instantly fall in love with the area. Once you see the Smoky Mountains for the first time, you will want to return to our cabins year after year to unwind on vacation! If your idea of relaxation is kicking back on a recliner to watch a blockbuster movie, check out our Gatlinburg cabins with a theater room! These incredible cabins feature huge screens and state-of-the-art sound systems to bring the multiplex experience to your cabin. Grab some popcorn and get ready to witness your favorite movies as you have never seen them before! The big screen is also a perfect spot to watch your home team play in their latest sports match or to catch your favorite television programs! Take a look at all of our cabins in Gatlinburg TN today to plan your relaxing vacation to the Great Smoky Mountains! We look forward to seeing you soon at Acorn Cabin Rentals!